Steven Soderbergh, the man behind the Ocean franchise, serves up a Southern-fried version that, although didn't make that big of splash in theaters, is every bit as fun, tense and enjoyable, even with a smaller cast. Speaking of the cast, it's great from a one-armed (sorry - one-handed) Adam Driver to a beach-blonde Daniel Craig and even he sweet-as-molasses Farrah Mackenzie - it's a cast that works well together. If you like smart heist films peppered with humor, Soderbergh is your go-to guy and Logan Lucky doesn't disappoint. Compared with the Ocean's Eleven films, Logan Lucky is a different animal. It's more laidback and leisurely paced. It's still reliant on the charisma and talents of its ensemble cast. Only this time, instead of the group appearing like self absorbed sociopaths, they're endearingly down-to-earth and likable. The heist at the center of the story relies more on chance if not dumb luck than genuine brilliance though and I doubt it'll hold up on repeat viewings. Channing Tatum is solid as the mastermind of the scheme but Daniel Craig and Adam Driver are the standout performers. The Logan family from West Virginia never had much in the way of luck, but when big brother Jimmy loses his job they decide to test it by staging a robbery of the Charlotte Motor Speedway track. No posts have been made on this movie yet. 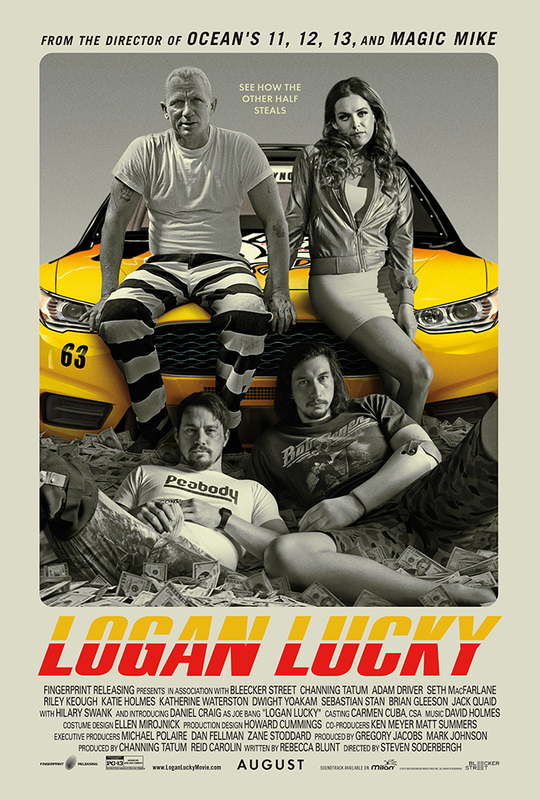 Be the first to start talking about Logan Lucky!